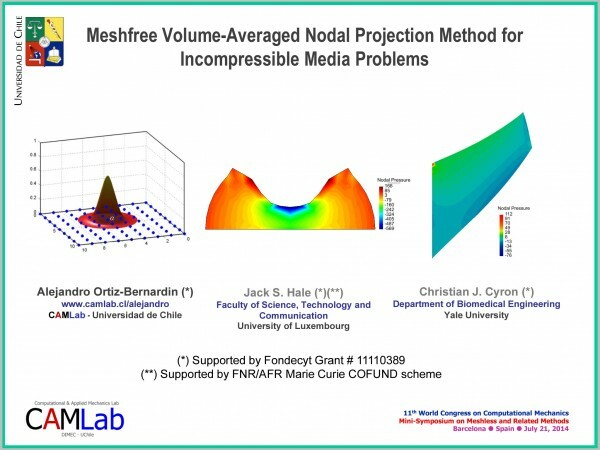 Key Words: Meshfree methods, Nodal Projection Methods, Incompressible Media. 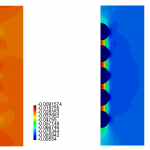 We present a generalization of the meshfree method for incompressible elasticity developed in Ortiz et al. . We begin with the classical u-p mixed formulation of incompressible elasticity and proceed to eliminate the pressure parameter using a volume-averaged nodal projection technique. This results in a family of projection methods of the type T_p/T_p-1, where T_p is an approximation space of polynomial order p over a background mesh of triangles or tetrahedra for integration of the weak form integrals. 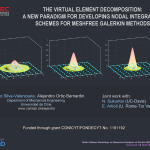 These methods are particularly robust on low-order tetrahedral meshes. 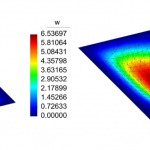 Our framework is generic with respect to the type of meshfree basis function used and reduces to various types of existing finite element methods such as B-bar and nodal-pressure techniques. As a particular example, we use maximum-entropy basis functions to build a scheme T_1+/T_1 with the displacement field being enriched with bubble-like functions for stability. The flexibility of the nodal placement in meshfree methods allows us to demonstrate the importance of this bubble-like enrichment for stability; with no bubbles the pressure field is liable to oscillations, whilst with bubbles the oscillation is eliminated. Interestingly, however, with half the bubbles removed, a scheme we call T_1*/T_1, certain undesirable tendencies of the full bubble scheme in the numerical integration of the weak integrals are also eliminated. For high-order approximations, we use the RPIM basis functions up to order three in the scheme T_p*/T_p-1, where the effect of the bubble is highlighted as a mechanism for pressure oscillation stabilization. 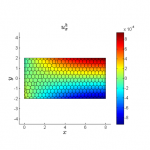 The so-devised method has important applications in linear and nonlinear incompressible elasticity as well as in incompressible fluids. 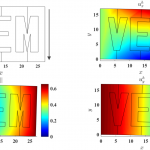 A. Ortiz, M. A. Puso and N. Sukumar, Maximum-entropy meshfree method for compressible and near-incompressible elasticity, Computer Methods in Applied Mechanics and Engineering, Vol. 199, pp. 1859–1871, 2010.